يشتمل على: فستان لا يشتمل على: تيرا، أحذية. My 3.5 years old daughter loves this dress. The little pink roses on the dress match her pink, jeweled crown perfectly, and off set the blue just right. The lace appears beautiful, not cheap. Even the little tan ruffles on the chest look well made. What sold us on the dress were the arms, which really make the dress stand out, and look just as delicate in person. The dress wasn't even wrinkled that much when I took it out of the box, since they shipped it in a long, flat box. My daughter felt like a princess as soon as she put it on. Fantastic Design and Top Quality Sewing! Bought the small size dress for our 3 year old granddaughter. It fit perfectly and we were all amazed at the excellent quality of the material and the professional way the dress was put together. 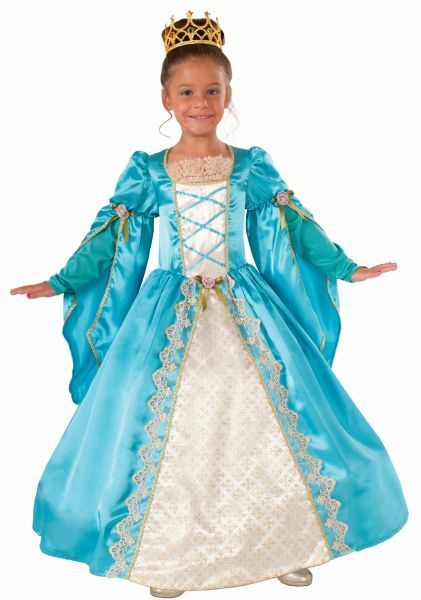 This looks a thousand times better than any princess dress I've seen in stores and the price was unbeatable. Recommended.